You may remember my gorgeous living room makeover by Four Chairs Furniture. I just can’t get enough of them! Everything they do is absolutely perfect in my eyes! Seriously, just check out their Facebook page. Are you dying over how fabulous everything is?! Well, if you love Four Chairs Furniture as much as I do, today is your lucky day! 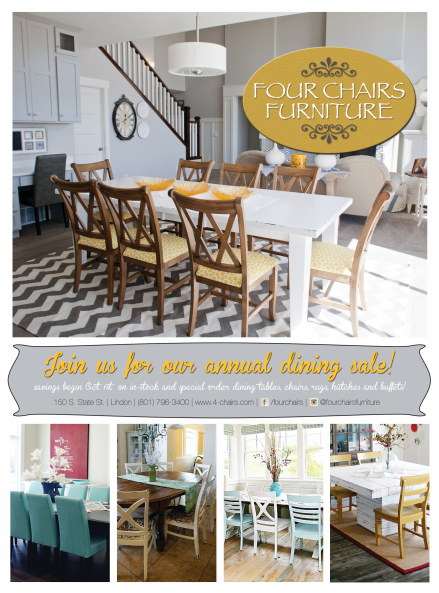 Four Chairs Furniture is having a huge Dining Sale! And if you don’t live in Utah, don’t worry! They ship! Their Dining Sale is going on now! Stop by Four Chairs Furniture and use the code “SIXSISTERS” to save 15% off all dining tables, chairs, barstools, buffets, hutches and rugs! Just when I thought I couldn’t love Four Chairs Furniture anymore, they decided to give away some darling dining room decor to one of our lucky readers! Stop by and check out their website! You can find so many gorgeous pieces of furniture and accessories on their website, as well as a Six Sisters’ Stuff Collection featuring some of our favorite things from Four Chairs Furniture! i have been needing a table & chairs for a while now. thanks for the chance to win these, they are really pretty.